"The bounty of Autumn--soft and creamy acorn squash--is mixed in subtle ratio with mashed potatoes for a seasonal kick on an old favorite!" Preheat oven to 350 degrees F (175 degrees C). Place the halved acorn squash cut-side down in a glass baking dish; add 1/2-inch water. Bake in the preheated oven until soft and tender, about 30 minutes. Remove squash from oven; scoop out flesh. Place potatoes in a saucepan with enough water to cover; bring to a boil. Reduce heat and simmer, covered, until soft and tender, about 20 minutes. Drain potatoes. 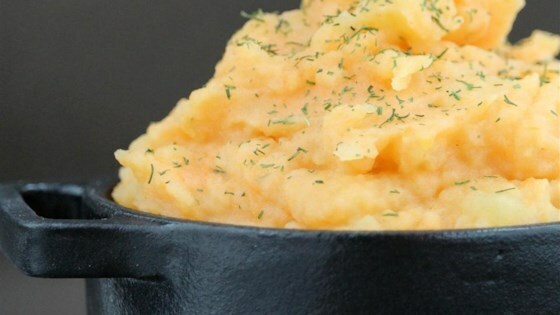 Mash potatoes partially in a large bowl; stir in squash flesh, butter, mustard, dill, salt, and pepper. Add milk gradually, mashing to desired consistency. You can peel potatoes or leave skin on, as desired. Substitute stone-ground mustard for the Dijon mustard, if desired. Margarine can be used in place of butter. Delicious! No need to change a thing. Creamy, tasty goodness! Thank you for the recipe. This is very good! I used less potatoes because it was only me eating it, but the flavor was great. A wonderful fall dish and I may do them next year for thanksgiving! This was a fun, autumn spin on a traditional classic. I didn’t alter the recipe at all and I’m happy with the end result. Super delicious!